*Post from 09/17/12. Images updated 08/17/16. I don’t know about you, but I’ve never really been able to taste zucchini in baked goods. Sure you can see green flecks sometimes, but you can’t really taste it. To me, the zucchini seems to take on the flavor of everything else. Because of this, I’ve never had an aversion to baked goods with zucchini in them and am always using up zucchini in different breads, cakes, and bars. This is a good thing, because I would be missing out on these bars! These bars taste a lot like carrot cake with the spices and cream cheese frosting. 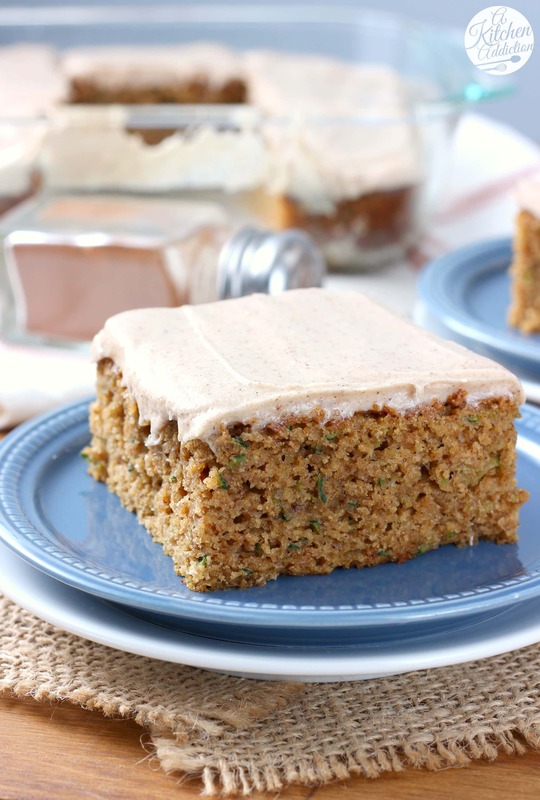 And you already know that carrot cake is one of mine and my husband’s favorites! I also added cinnamon and cloves to the frosting to give it a little extra spice. . . so good! I am sure most of you won’t have much of a problem getting your hands on some zucchini. . .so go find some and make these bars! Preheat oven to 350. Spray an 8x8 inch baking dish with non-stick cooking spray. In a large bowl, whisk together sugars, yogurt, milk, vanilla extract, and egg until well combined. Thoroughly stir in flour, baking soda, cinnamon, and cloves. Add zucchini and stir until just combined. Pour batter into prepared baking dish. Bake for 20-25 minutes, or until toothpick inserted in the center comes out clean. While cake is cooling, prepare frosting. In a stand mixer, or with an electric mixer, beat together cream cheese, butter, and vanilla extract until creamy. Add in confectioner's sugar, cinnamon, and cloves and beat on low until combined. Increase speed to medium high and beat for 1-2 minutes so frosting is light and fluffy. Spread frosting over cooled cake and serve. Ahh, I don’t blame you for grabbing a fork as soon as the photo sesh was done. Those bars look amazing and that frosting, oh my goodness! Yeah, I just couldn’t handle the waiting! Oh, you need to try, Hayley! I’m sure you would come up with some fantastic recipes! These are the exact flavors that I’m craving right now…warm and sweet with a little spice! My garden FINALLY ran out of zucchini, but these bars are definitely worth going to the store over! Oh, they are! 🙂 Thanks, Julia! Pass a fork, Jessica! This looks so tempting! Yum! Yummy! It looks so Yummy! Especially that spiced frosting! You know I never really thought of it before but I agree, zucchini baked goods taste like cinnamon. These bars look fantastic. Perfect way to say goodbye to summer. yum! i would eat first and take pictures later!! Yum! 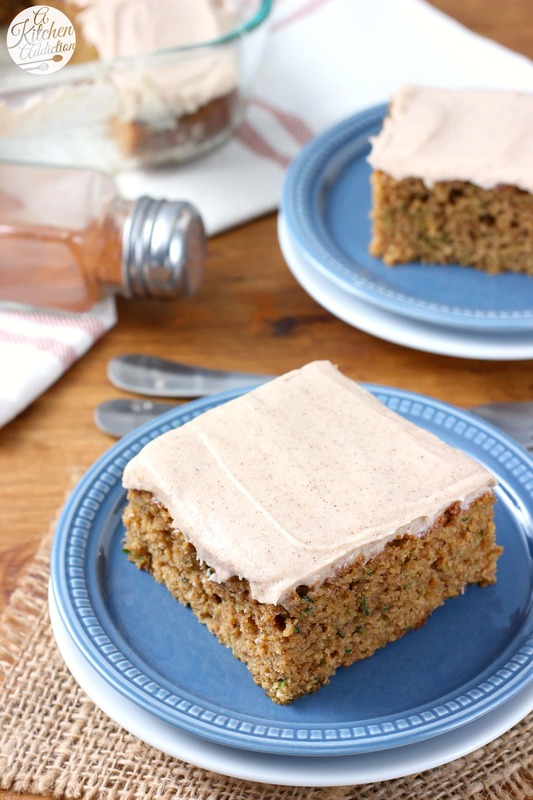 I love zucchini cake bread bars anything! Yum, that looks amazing! I love the spiced cream cheese. I love a spiced frosting! and still have zucchini to use up! Great recipe! 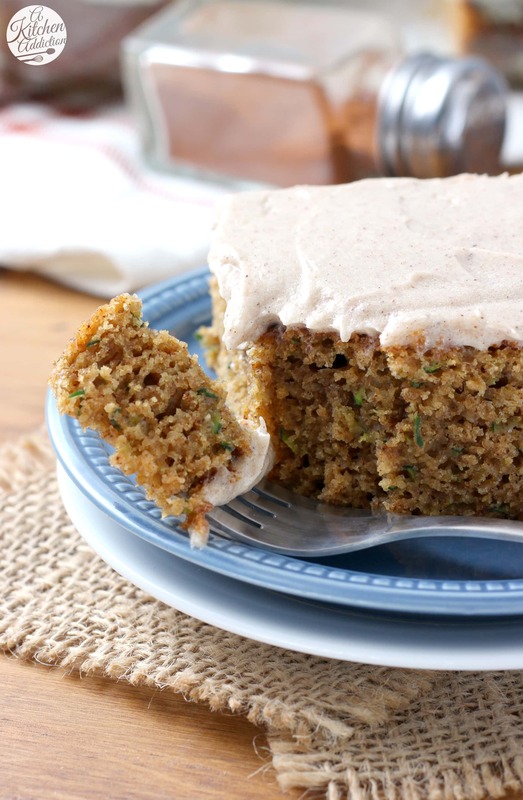 I love zucchini for cakes and this spiced frosting! I can never resist anything with cream cheese frosting! Cream cheese frosting is definitely a weakness of mine! I love the cream cheese and zucchini cake combination. What a great way to start fall. I’m loving the spiced frosting — what a great idea. Now that these bars caught my attention, I’m off to browse (& pin) your other goodies! I also see that you have an affection for the MN Twins… are you a native Minnesotan? My zucchini plant has started to die. I will have to save this one for next year. I love the addition of cinnamon to the frosting. You have me crave for some zucchini bars! The spiced cream cheese frosting sounds amazing. I’ve never tried zucchini in baked goods before but I heard about it once on a TV programme when a woman was dieting and not willing to give up her cupcakes, LOL. These do look like carrot cake but sound even better. The flecks in the frosting look great too. Looks delicious! Moist and that frosting sounds and looks so great! I don’t know how I missed these scrumptious bars!!! Pinning this very second! Love pumpkin, love zucchini, love spice and cream cheese. How could you go wrong with these? Can’t wait to try them! I have two HUGE zucchini in my fridge right now and I just made 5 dozen zucchini banana muffins last week. Lol. 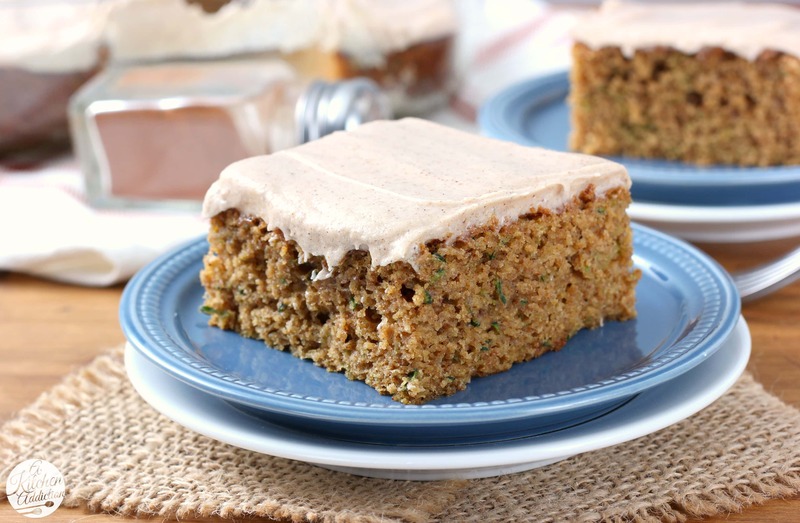 SO I am definitely looking for more zucchini baked goods! Love these!